Ngurah Rai International Airport remains the top foreign direct arrivals contributor for Indonesia, followed by Soekarno-Hatta, Jakarta and Hang Nadim, Batam. From January to November 2016, Ngurah Rai recorded 6% growth y-o-y, with Bali arrivals making up a whopping 40% of total arrivals to Indonesia. 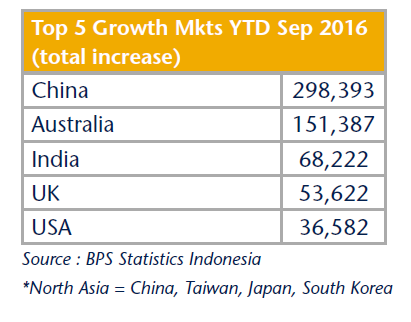 Batam recorded the highest growth rate of 9% y-o-y, meanwhile, Jakarta remains flat impacted by the global and local economic malaise. improve the public transportation that will connect Jakarta city center with the airport. 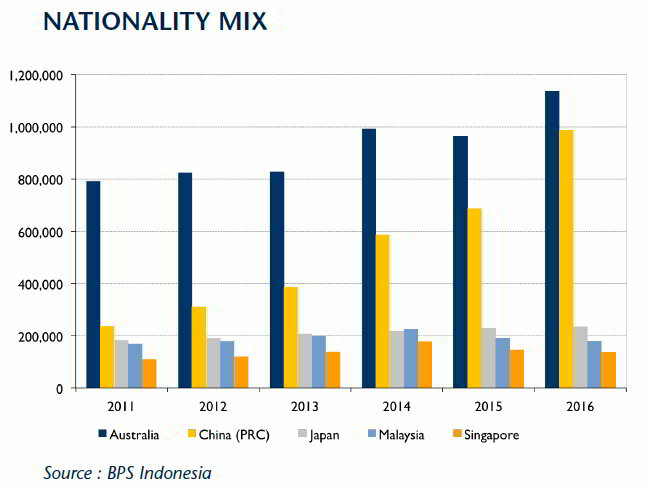 Following the signing of a decree waiving visa requirements for a total of 169 countries, including Australia (which was politically excluded for many months), year-end 2016 Australia remains the number one foreign source market to Bali making up 23% of total foreign arrivals, up 18% over the previous year. Arrivals from the UK grew a significant 32%, France by 26% and Germany was up a noteworthy 28% y-o-y, helped by improved European connectivity through daily direct flights via Dubai. China continued its strong arrivals growth year-end, up almost 300,000 people y-o-y (43%) to just under 1 million tourists. It was the 2nd fastest growth market by percentage and the largest by volume. 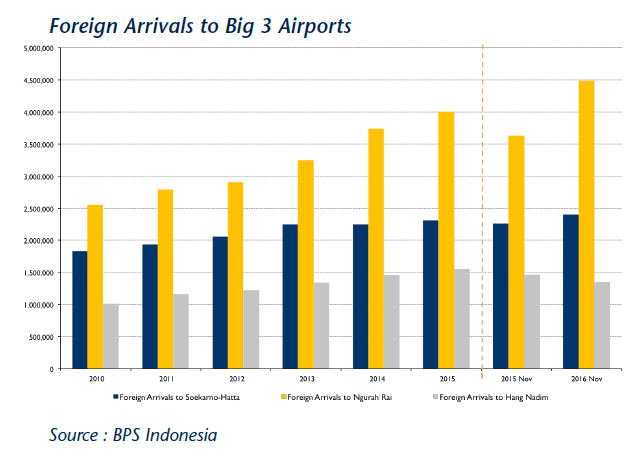 With more flights scheduled to connect Bali and cities in China, we expect this volume to explode further and China to become the most important arrivals source market to Bali in Q1 2017. 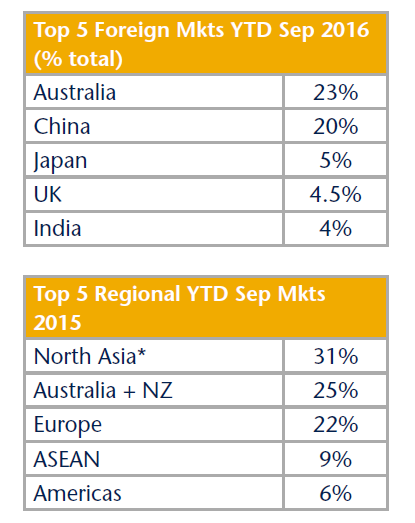 Regionally, there is no significant change in the source mix with the ASEAN market growing a small 3% y-o-y and the other Asian market (non-ASEAN) falling 5%.